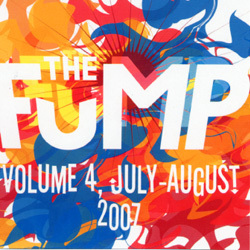 The FuMP, the Funny Music Project, just put out Volume 4, their July-August collection of songs that were on their web page. Each week they post two new songs and every two months they release a collection with the songs, plus bonus material. I designed this CD including the front and back cover. The CD has music by Rob Balder, fellow Fruhead, Paul and Storm, formally of DaVinci's Notebook, Sudden Death, Worm Quartet, Luke Ski, Possible Oscar and many others. The CD is available for $10 either on http://www.thefump.com or from me in person at conventions. If you guys made a MySpace and/or Facebook I'd add you guys in a second! On second thought...I MySpace added yas. The Fump is on both Facebook and Myspace. I also have the cover for Volume 5. I will post about it when it comes out.